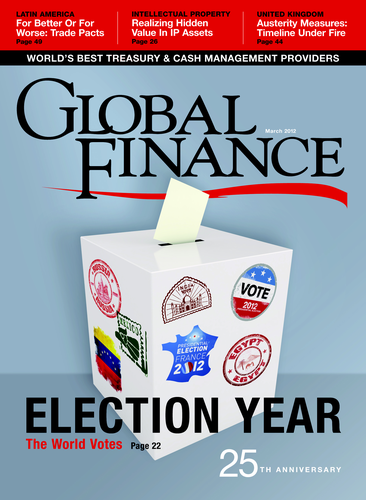 In deciding to focus on elections worldwide for this month's cover story, we weren't just pondering their political implications and the relative uncertainty they occasion, we were also considering the global nature and impact of uncertainty in a single national election. Many international programs, projects and investments are on hold as a result of election-year ambiguity. In this era of globalization, who will be the next tenant of the White House in Washington or of the Élysée in Paris matters not just for its political implications but also for its impact on trade, economic policies and financial regulations worldwide. 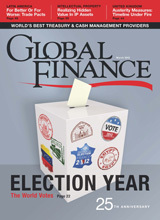 The heavy calendar of elections this year increases the risk of political gridlock and puts pressure on existing trade relationships. It also highlights risks around foreign policy and global political cooperation. The European crisis seems far from over, and whether Greece will default on its debts or swallow the pill of austerity that the doctors in Brussels have prescribed remains to be seen. The new concern is that the crisis on the Continent is beginning to affect the economic data of other countries. China, for example, had lower exports in January this year than in the same month in 2011, and some economists are now forecasting a trade deficit for 2012 in the world's second-largest economy. The austerity measures imposed by many European governments are stifling domestic demand—with negative knock-on effects on imports of foreign goods. These countries seem to be trading medium-term growth prospects for reduced public deficits and rebalanced economies. But, as is often the case with tough medicine, these policies could have negative side effects. And the effects will be felt not just in the countries that applied austerity measures, but worldwide.